You won't believe how many cool things you can do with the Samsung SmartThings Home Monitoring Kit. 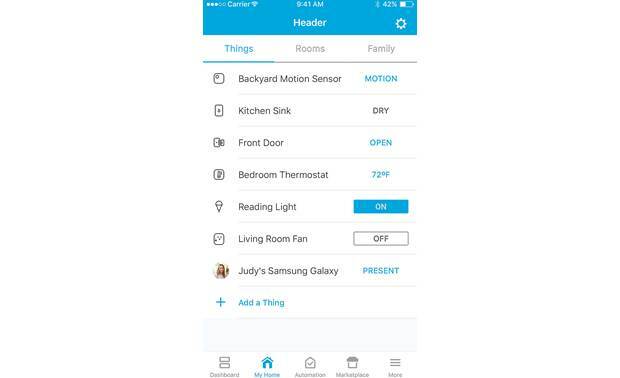 You won't believe how many cool things you can do with the Samsung SmartThings Home Monitoring Kit. It comes with a package of sensors that help you monitor what's going on at home, and a control hub that lets you trigger lights, appliances, and more to turn on or off automatically. The 2018 version adds geofencing, so you can see who's home, and even set your connected devices to function according to that person's preferences. The 2018 Samsung SmartThings Home Monitoring Kit's geofencing feature lets you customize your smart home's functions based on who's home. Setup is a breeze. Plug the hub into your router with the included Ethernet cable, and into the wall for power. The free SmartThings Mobile app (Apple®/Android™/Windows®) gives you full access to all of the connected devices that you have in your home. 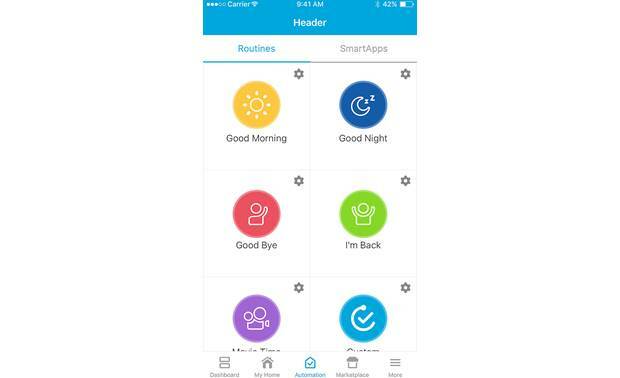 Each time you add a new SmartThings device, you'll see it appear within the app. A few taps of the finger later, and you're up and running. SmartThings devices work together to make your time at home easier, safer, and more fun. 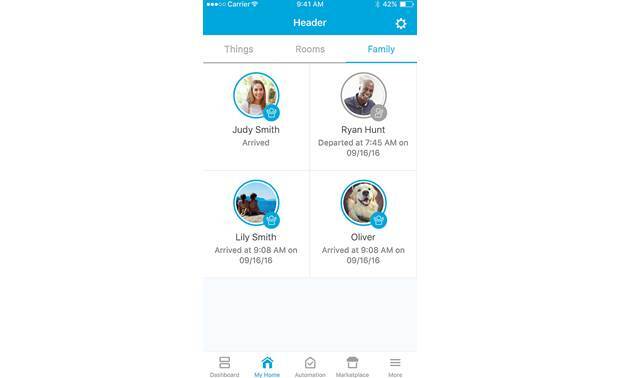 With optional accessories like the arrival sensor, you can receive a text when your child gets home from school. Living in fear of water in your basement? The water leak sensor will alert you so you won't come home from vacation and find an unexpected flood. That's just the tip of the iceberg. You can also use the SmartThings app to create custom commands that are triggered by certain events. Use the included motion sensor and outlet in tandem so that when you wake up, fresh coffee begins to brew. Automatically, the local news starts to play through your Sonos Play:1 speaker in the kitchen. Use your phone as a proximity sensor, and with an optional smart door lock your front door will unlock as you pull into the driveway. Your home can be locked and unlocked remotely from your phone anytime, anywhere. You'll never need to hide a key again. 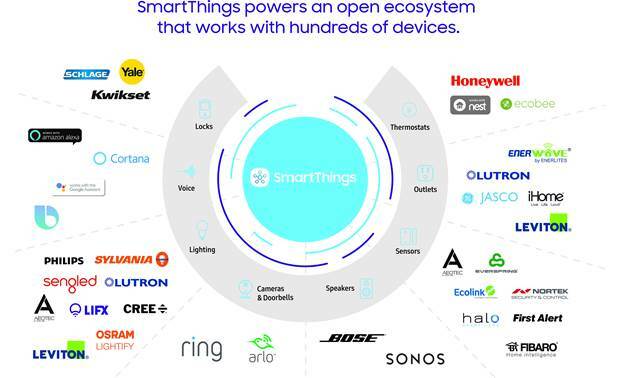 Samsung's SmartThings is designed around an open platform. 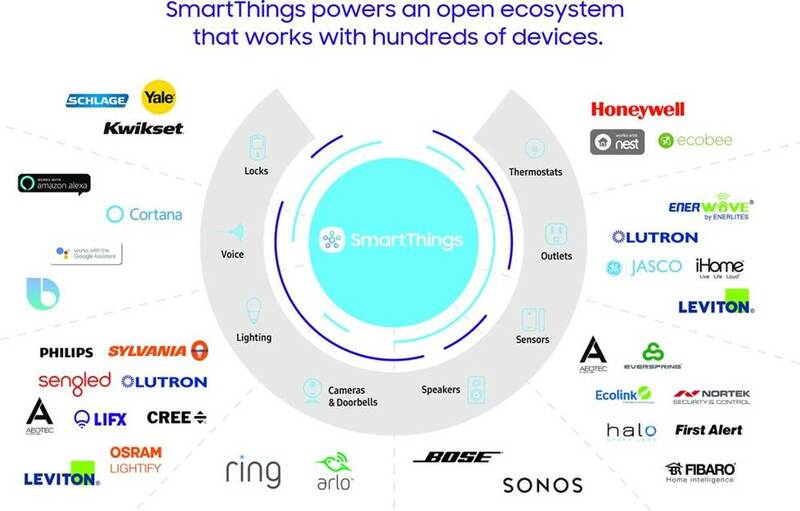 Not only can you use SmartThings accessories, but there are a wide range of products from different companies that easily integrate into the system. You can add light bulbs, thermostats, cameras, door locks, wireless speakers and more. Control everything from a single app. Samsung SmartThings is compatible with smart home devices from several other manufacturers. 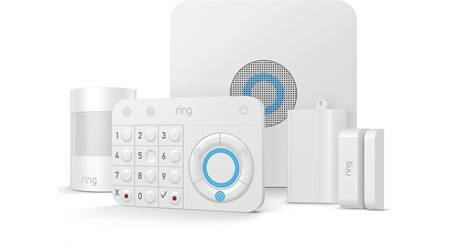 Overview: The Samsung SmartThings Home Monitoring Kit contains several sensors and a central monitoring hub that helps you make sure your home is safe. The kit contains a Hub, 2 Multipurpose Sensors, a Motion Sensor, and a Smart Outlet. Optional sensors can be added to the system to give you a complete home monitoring system. The SmartThings monitoring system is controlled via Wi-Fi and the SmartThings Mobile app for your smartphone or tablet. 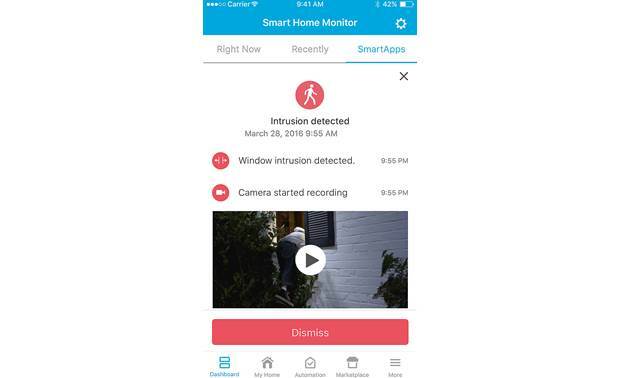 No contracts or monthly fees are required to monitor your home with the SmartThings kit. 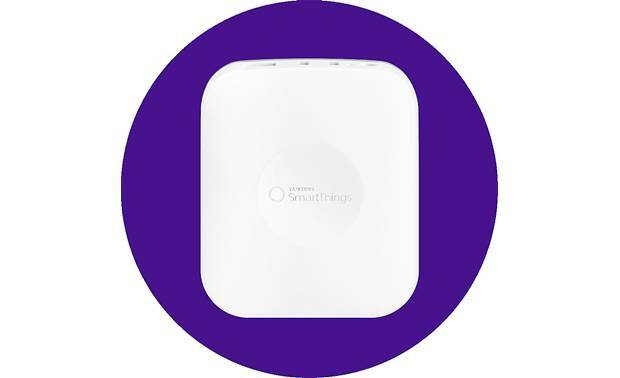 SmartThings Hub: The SmartThings Hub (STH-ETH-250) pulls all of the elements of your SmartThings monitoring system together: all of the connected sensors, your smartphone or tablet, the SmartThings app, and the SmartThings cloud. The Hub wirelessly connects all of the sensors around your home so they can send information to your smartphone, or to each other. The Hub needs to be connected to power and your network (AC adapter and Ethernet cable included). In addition to the wired Ethernet connection, the Hub has ZigBee (2.4 GHz), Z-Wave (900 MHz), Cloud-to-Cloud, LAN, and ZigBee3 protocol for connecting and communicating with third party devices. The Hub comes with 4 "AA" batteries that serve as backup power for approximately 10 hours, in case of a power outage. Dimensions: 5"W x 5"D x 1-1/8H", Weight 5.8 ounces. SmartThings App: The SmartThings app for your smartphone or tablet lets you easily control, monitor, and secure your home from virtually anywhere in the world. The app is available from Apple iTunes for iOS devices running version 11.0 or later, and from Google Play for Android devices (6.0 or later). 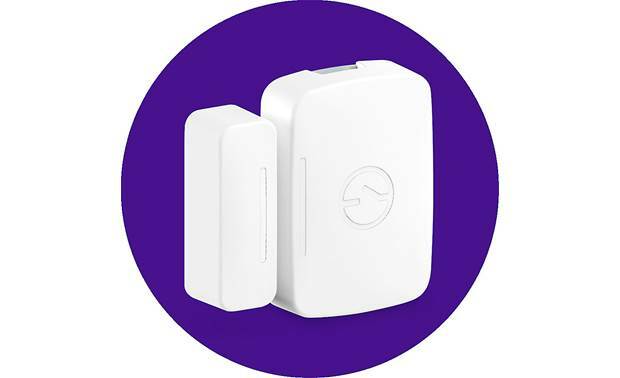 Multipurpose Sensor (2): The SmartThings Multipurpose Sensor consists of two parts: the sensor and a magnet. The sensor and magnet can be mounted on opposite sides of door and window openings, so that the two parts are aligned side-by-side. When the door/window is opened, the two parts become separated. This change in the magnetic field triggers a response to the SmartThings Hub. The Multipurpose Sensor can also be used to monitor access to drawers and cabinets. Its vibration detection capability allows you to monitor your a washing machine or dryer, informing you when your laundry is finished. The sensor is also sensitive to temperature changes, and can let you know if the heating or air conditioning is failing. In the SmartThings app, you can choose how the system responds to the trigger, from sending a notification to your phone or tablet, to turning on lights, or adjusting the thermostat. The Multipurpose Sensor comes with an adjustable mount, and is powered by a CR-2 battery (installed). The sensor's dimensions are 2.19" x 2.223" x 0.9", and it weighs 1.5 ounces. Motion Sensor: The SmartThings Motion Sensor can detect motion up to 15 feet away. It has a field of view of approximately 120°. The sensor angle can be adjusted in all directions when placed on the magnetic ball-type mount. When the sensor picks up motion in its field of view, it triggers a response to the SmartThings Hub. In the SmartThings app, you can choose how the system responds to the trigger, from sending a notification to your phone or tablet, to turning on lights. The Motion Sensor comes with a removable wall mount, and is powered by a CR2477 Lithium battery (installed). The sensor's dimensions are 2.058" x 2.109" x 1.011", and it weighs 1.5 ounces. 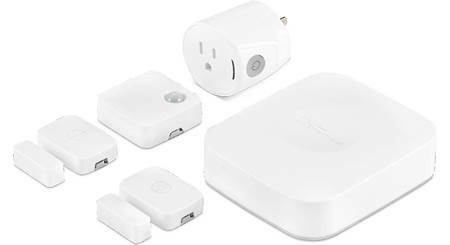 Outlet: The SmartThings Outlet lets you control lights, small appliances, and electronic devices through the SmartThings app on your smartphone or tablet. Just plug in the devices you want to control, and use the app to turn them on or off manually or automatically. 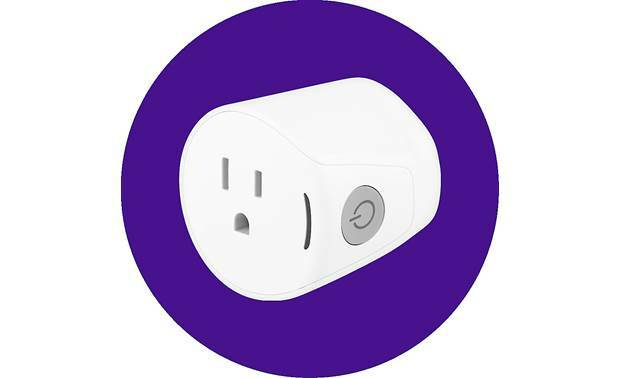 The outlet plugs into any standard 3-prong AC outlet, and accepts a standard 3-prong AC plug. The SmartThings app lets you turn lights on or off on a schedule, in response to another activity, as part of a SmartThings Routine, or manually. A top-mounted power button lets you manually turn the SmartThings outlet on or off manually, if needed. The Outlet is 2" x 2" x 2", and weighs 3.5 ounces. Optional Sensors: In addition to the included sensors, you can add many other optional sensors to the Samsung SmartThings Home Monitoring Kit. All of the sensors require the use of the SmartThings Hub. Arrival Sensor: The SmartThings Arrival Sensor lets you know who comes to and leaves from your home. The sensor is a small device that you can attach to a child's backpack, a pet's collar, or your car. 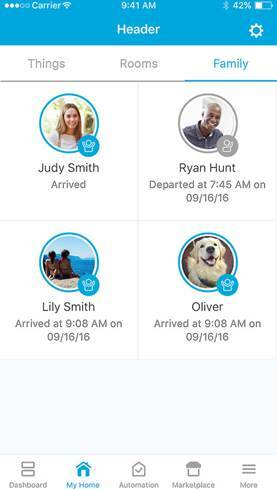 You'll receive a notification on your smartphone when your child or pet leaves or arrives at your home. You can keep the Arrival Sensor in your car to automatically turn on lights when you get home. When kept on your keychain, you can trigger the sensor to emit a beeping noise to help you find your keys at home. The Arrival Sensor is powered by a CR-2032 battery (installed). Dimensions: 0.998" x 1.932" x 0.506", Weight 0.38 ounces. 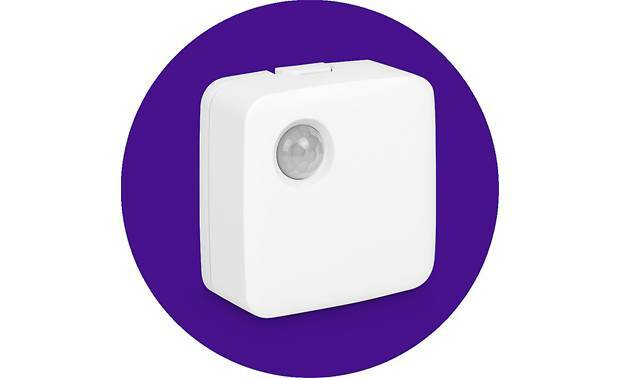 Water Leak Sensor: The SmartThings Water Leak Sensor is a wireless device that is placed on the floor of your bathroom, kitchen, or laundry room to immediately alert you when a water leak is detected. The sensor can also monitor temperature, and can automatically turn on a portable heater if the temperature drops (SmartThings Outlet required). The Water Leak Sensor is powered by a CR-2 battery (installed). Dimensions: 2.379" x 1.474" x 0.84", Weight 1.4 ounces. Amazon Alexa: With Amazon Alexa, you can control connected devices with your voice. Google Assistant: The Google Assistant lets you control connected devices with spoken commands. Netgear Arlo: Netgear Arlo HD security cameras can be monitored through the SmartThings app. The cameras can be set to start recording if a window or door is opened unexpectedly, or if motion is detected in your home. Bose SoundTouch: The SmartThings Hub can trigger a Bose SoundTouch wireless music system to start playing your favorite music when you get home. You can also control the volume and music playback using your smartphone. Smart Locks: Smart door locks from Yale, Schlage, Kwikset, and other manufacturers can be set to lock and unlock as you come and go, and allow you to lock and unlock the doors from anywhere. Philips Hue: You can control your Philips Hue lights with the SmartThings app for iPhone or Android. Not only can you turn them off or on, you can choose from 16-million colors and 50,000 shades of white. (Requires Philips Hue Bridge and Wi-Fi internet connection) Other smart lights from Sylvania, Cree, and dimmer switches from Leviton, Lutron, and ecobee are also compatible. Thermostats: Using the SmartThings Mobile app, you can control and monitor the temperature in your home, saving money on your energy bills. Connected thermostats from Honeywell, ecobee, 2Gig, and other manufacturers are compatible. Routines: The SmartThings app lets you configure several series of actions called Routines to occur at specific times of the day, or in specific situations. These actions are personalized, and can be performed automatically or on command. There are four default Routines: "I'm Back! ", "Good Night,", "Goodbye! ", and "Good Morning!" If you have a compatible Samsung TV, you can also set up a "Movie Time" routine. When you add a routine, you can configure it specifically for your home: turn lights/switches on or off, set dimmers to a certain level, lock or unlock doors, open/close the garage door, etc. You can tap the specific icon in the app to manually activate the Routine. You can also automatically activate the Routine when someone arrives or leaves, or at specific times, at sunrise/sunset, when something opens or closes, or when motion starts happening or stops. Routines can be edited or deleted whenever you choose. 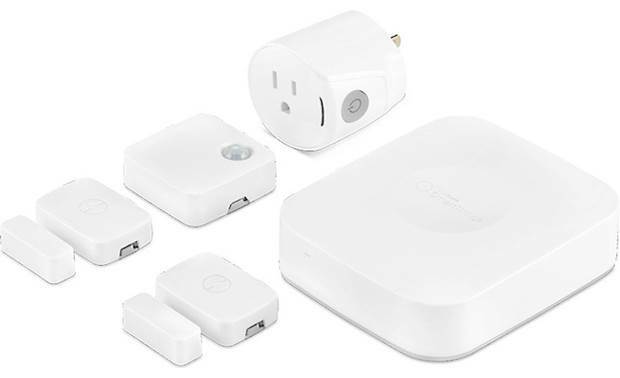 Searches related to the Samsung SmartThings Home Monitoring Kit (2018) Wireless home automation system with power outlet and sensors.